Hey, online retailers, I don't have time to design my own outdoor rug. That's what you're for. Our back porch is about 5 feet wide and about 14 feet long. I *cannot* be the only person with a narrow, but LOOOOONG back porch in the market for an outdoor rug. I just can't. And yet. It appears I can. Flor doesn't sell outdoor rugs. Other places I've looked: Pier 1, QVC, CB2, West Elm, JCPenny, Overstock, Room and Board, Plow and Hearth,William Sonoma, and AllModern.com. Nothing is the right size. I've made canvas floor cloths in the past, but I want something squishy and soft under my feet. The only other option appears to be buying two runners (Maybe two of these?) and laying them next to each other, or buying two 4x7ish rugs and putting them back to back. Maybe this one? Or this one? Or - I could buy one of these in a custom size and paint some kind of funky stencil on top in a big bold design like the ones below? I'd LOVE to hear your suggestions! Ugh! I like the option of using two dash and albert rugs. You can look at the out door rugs and runners at Home Depot and Lowes both hold a variety of stock - many for fancier budgets. They each also have a back section that can cut one to fit. Check with a full service carpet store. We have one here that will bind the edges of cut carpet so you have a finished, vacuumable(? ), no unsightly strings, area rug of sorts. I know nothing of rugs, but I want to say that your porch's color scheme and my house's match! We recently painted all the wood a similar shade of gray (yes? ), and the doors the green. I applaud you for your good taste! You know what, my green is brighter. More kermit-like. Now, I don't know a lot about rugs, but I say get the custom and paint it! Love how the porch looks! Good luck with finding a rug. 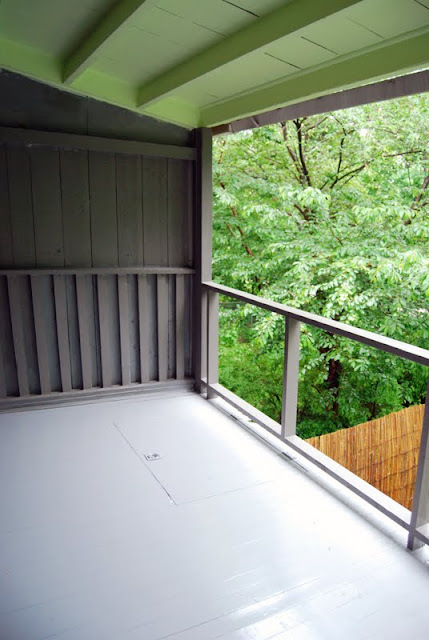 Most importanly-what color is that green on your porch ceiling? I love it! It just pops with that brown. 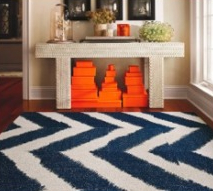 what if you got a bunch of doormat sized rugs and bound them together in a checkerboard pattern? i bet you could do this pretty quickly and easily, and it would look super cute. plus, you'd have a much bigger selection of styles and colors. I love the black & white version! my favourites are the coral coloured squares and the green one. I love cool geometric patterns and those colours are great! 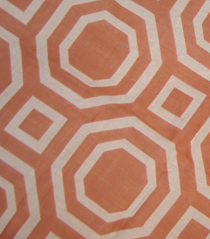 Plus, coral seems to be the colour of the year - I'm seeing it everywhere! I was going to suggest something along the lines of what Brigid said. In the past for inexpensive rugs I'll call a bunch of discount carpet warehouses and negotiate the price of their scrap. You have a billion choices and they'll cut and bind it to whatever you like. Plus, it's good quality pieces for super duper cheap. If you can't find an actual outdoor rug solution, this could look really cool.